6 x 10 Heavy Gauge Steel Floor Register Discounts Apply ! 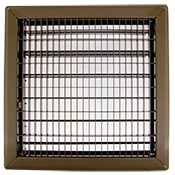 This air vent is a commercial grade steel register by Continental Industries and meets the requirements of the Buy American Act. It features a durable toe-operated metal damper which can be opened or closed fully according to your preferences. The smooth surface has an air flow free area averaging 75% and is finished in a neutral tan shade, allowing the vent to easily blend in to a variety of decors. Its sturdy construction and commercial grade strength allow for product performance even when placed in areas where there is wheeled or heavy foot traffic. Browse heavy-gauge floor grilles (which do not feature a metal damper) for the same quality and affordability. Regarding measurements: Please ensure you are measuring the actual size of the hole into which this product will be placed. Do not measure an existing faceplate for dimensions. For instance, if floor hole size is 6 x 10 inches, please purchase a 6 x 10 register. The damper drops into the vent opening approximately 2 7/8 inch. Faceplate has an approximate thickness of 3/16 inch with overall dimensions that are 7 13/16 x 11 13/16 inches. See vent and damper detail by viewing the enlarged version of the photo above.